Experience the magical caves with an entry ticket to the Cuevas dels Hams in Porto Cristo and marvel at the wonders of the nature. Explore the Cuevas dels Hams in Porto Cristo with your entry ticket. The cave system has been shaped by water movement for thousands of years and now offers a unique excursion destination for the whole family. There are a total of three caves. The round cave was originally a closed cave and now offers an open area with a botanical garden and you can also look forward to the sighting of native bird species. In the classic cave, you will see a formation of stalakmites and stalactites as well as a small lake and in the blue cave you will experience a beautiful color game that leads you into another world. You will learn more about the development of Mallorca, the caves and the first inhabitants of the island. Also admire "Samson's Pillars", the "Plains of Mrs. Mauro" and the "Pit from Hell"! Days: daily, except for 25.12. and 01.01. Majorca has a breathtaking landscape, a wonderful alpine world and paradisiacal beaches with turquoise water, but the island has more treasures to offer. One of these special natural treasures can be found on Mallorca with your entry ticket to the Cuevas dels Hams in Porto Cristo. The cave system has been excavated and formed over thousands of years by water, so that it now has a unique formation of stalactites, stalacmites and an inner lake. The cave system is divided into three caves, which you can visit with your entry ticket for the Cuevas dels Hams. The round cave was once completely closed, but nowadays you will find a botanical garden and you can also discover some native bird species. The classic cave of the Cuevas dels Hams in Mallorca is home to a small lake and wonderful cave walls formed by the vigor of the water. Finally, you will be captivated by the blue cave: in a beautiful color game, which makes the cave a magical place, you will immerse into the history of Majorca and the Cuevas dels Hams in Porto Cristo, as well as in the history of the first inhabitants of the island. The history of the Cuevas dels Hams in Porto Cristo dates back to approx. 10 million years ago, but the unique cave system was discovered in 1905 by the cave explorer Pedro Caldentey Santandreu, who was looking for the gemstone type "Onyx". In 1910, when there were no electrical supplies in Porto Cristo, Santandreu set up an electrical system to illuminate the caves, and the Cuevas dels Hams on Majorca became an excursion destination. With your entry tickets for the Cuevas dels Hams in Porto Cristo, you can look forward to a great trip with your whole family at a great price - children up to 4 years can even benefit from free entry. Very good alternative to the dragon caves! Beautiful caves quite different than one knows Tropdsteinhöhlen of Germany. Sehr gute Alternativezu den Drachenhöhlen! Wunderschöne Höhlen ganz anders als man Tropdsteinhöhlen von Deutschland kennt. 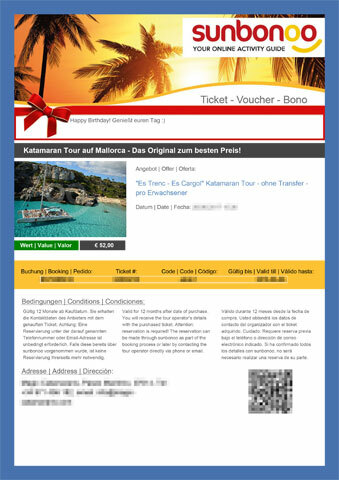 You're reviewing: Entry tickets for the Cuevas dels Hams in Porto Cristo on Majorca. How do you rate this product?